I will be going to see Philadelphia’s Mike Jones fight Irving Garcia live at Boardwalk Hall on Friday July 9. While emailing back and forth with esteemed trainer Freddy Marratto about the fight he made a good point. Take the opportunity to see Jones now while he is still fighting in the Philadelphia area. Freddy pointed out that with possible big fights on the horizon for Jones (possible big names being mentioned include Andre Berto, Shane Mosley, and Kermit Cintron) he may be out of our proximity soon as his fights move to Las Vegas. This prompted my thinking that while I am happy for the Philadelphia native Jones I feel this aspect of the sport can often be a negative that deprives fans of rooting for hometowns fighters the way they root for hometown sports teams. After all, what would the Phillies, Eagles, Flyers, and Sixers be without the name Philadelphia preceding the team. Would Phillies vs. Mets or Eagles vs. Cowboys be the same if the game was in Las Vegas. Of course not because the popularity of most sports is largely based on the attachment to a city, geographic area, and local culture. Fights with a hometown guy have a certain energy and enthusiasm in the crowd. The pride and cheers that ring out when a fighter is announced with his hometown (i.e. Mike Jones being announced from Philadelphia on July 9) brings a roar from the crowd that is based on being a fan of the fighter but also the pride in supporting your city. While I have my favorite fighters that I root for (see Miguel Cotto bias here) if Mike Jones one day is at the top of the sport myself and many proud Philadelphia fans will have a connection and support for him that cannot be matched by another boxer. That connection is largely built with small hometown fights that eventually become big hometown fights (Blue Horizon and small room at Boardwalk Hall becomes the Wachovia Center or main room at Boardwalk Hall). Sure Vegas has many advantages and the biggest fights will probably remain in the their casinos. Biggest paydays, a neutral site without as much concern for biased judging, access to hotels, etc. These advantages will almost guarantee the major events such as a possible Mayweather vs. Pacquiao fight occur in Vegas. Understood, but take for example if Mike Jones was to fight Shane Mosley in the next year. Sure it could be in Vegas. Yes they would both probably make great money whether it was on HBO or pay-per view. Maybe the arena would look filled with tickets largely given to high rollers at the casino. Even some fans of each fighter from Pomona California for Mosley and Philadelphia for Jones would make the trek. But what if the fight was at the Staples Center in Los Angeles? The energy and vibe would be electric as fans in California proudly filled the building to create a hostile environment supporting their aging star to take out another young challenger. Or the opposite, raucous Philadelphia fans packed either Boardwalk Hall, the Wachovia Center, or even a summer fight outdoors at Citizens Bank Ballpark. How loud and thrilling would it be with over 10,000 in any of those places to root Jones on to take down the future hall of famer? Either scenario is guaranteed entertainment for either side. Picture being at home watching on HBO as LA fans with Lakers jerseys booed Jones and rooted for Mosley. Even though a Philly fan would hate the site they would admit that is more exciting than watching them go at a neutral site. Of course the reverse is appealing. Philly fans (in my biased opinion the toughest fans in the country) garbed in Phillies or Eagles gear packing the house in an attempt to motivate Jones and intimidate Mosley, one of the toughest competitors I have ever seen in a ring (note, this is not an endorsement for the actions that get us Philly fans on the wrong side of Sports Center, just encouraging the pride and loud cheering that has unnerved more than one bullpen pitcher in the past). And it does not always mean fighters in their “hometown” but where he has a following. Cotto is born and lives in Puerto Rico but due to the large contingent of Puerto Ricans in New York he packs the Garden on the eve of the Puerto Rican parade with a thrilling atmosphere. Tomas Adamek is drawing 10,000 plus to the Prudential Center in Newark, New Jersey based on being an exciting fighter and the large Polish community in the area. Adamek has even used this as way to buck the trend of only fighting when HBO offers a date. Adamek has chosen to stay active so he fights at the Prudential Center to large crowds despite not getting TV dates. I could go on and on with possibilities. Juan Manuel Lopez taking over the Puerto Rican mantle in New York when Cotto is gone. Gamboa would be huge in Miami as a Cuban fighter. 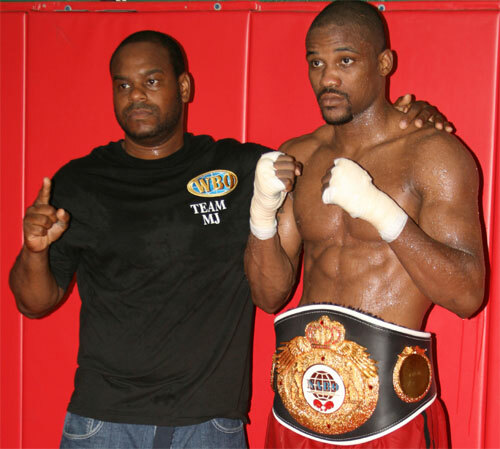 Paul Williams could stay active fighting in Washington DC instead of waiting for big HBO fights. Rising Middleweight Danny Jacobs is a Bronx native and received huge cheers at MSG on the Khan-Maliggnaggi undercard. Devon Alexander could take over for Cory Spinks as the pride of St. Louis. Alexander was born in raised in St. Louis and proudly sports Cardinals gear during his ring entrances. He would be a huge star in is hometown by taking on Zab Judah to avenge the Spinks loss in the last big fight in the Lou. It can be tough to build such an atmosphere in a sport that does not have a guaranteed draw or fan base at times. Andre Berto fought Carlos Quintana in his hometown and barely drew 4,000 people. I believe that was a promotional issue because Berto had not been fighting regularly in his hometown and did not build up a following. Andre Ward is doing very well fighting his last three big fights at Oracle Arena in Oakland and the electric atmosphere at those fights is obvious from TV. Juan Diaz is a huge draw and entertainer in Houston. Lucien Bute fights in front of monster crowds in his adopted town of Montreal. Kelly Pavlik provides Youngstown Ohio’s blue collar residents their blue collar champion and they proudly fill arenas in Ohio or even all the way to Atlantic City to support the former Middleweight champ. It can be done and boxing will be better for it the more this happens. These fights benefit from a true hometown sporting atmosphere live and the TV broadcast benefits as well from the atmosphere of the live crowd. I feel the need here at the end to encourage all reading as a Philly fan and boxing fan to get to AC on July 9 and help us make the place shake for Jones and the pride of Philly. Tickets are reasonably affordable between $50 and $100 (look for me about 13 rows from the ring probably in a Phillies jersey with my notepad and my dad snapping pictures). Question, comment, agree, disagree, or anything at all, send it to Gary at: gpurf3@hotmail.com.